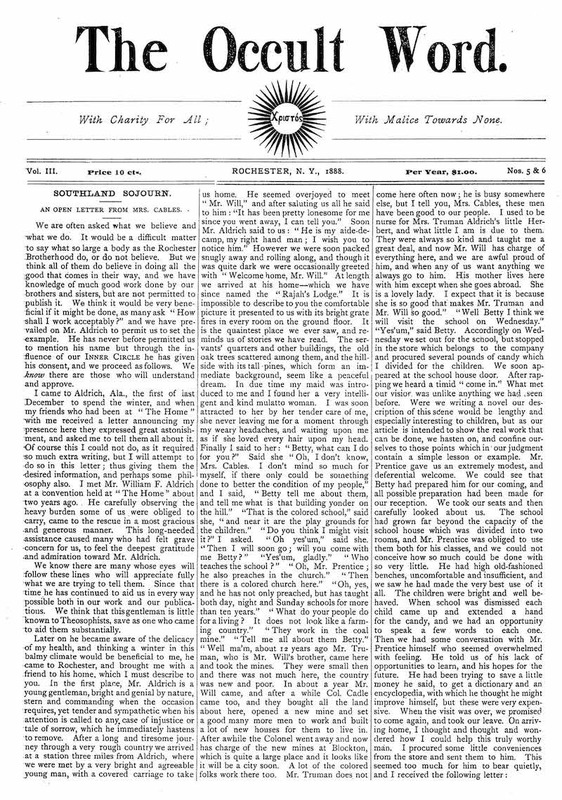 A Monthly Journal Devote to the Interests of the Theosophical Society and for the Dissemination of Oriental Knowledge / The New Light From India. Rochester, New York. Editor: Josephine W. Cables, George Crittenden. Corporate author: Rochester Brotherhood1/1, April 1884-April 1889. $1.00 a year and then free. This has not survived in public collections, though A.E. Waite saw the complete run of it in England, and both J.D. Buck and S.C. Gould refer to it and give its dates. This journal played an important role in the revival of the Theosophical Society in the United States since for a time it was the only American Theosophical journal-although an idiosyncratic one. Josephine W. Cables was a tireless, and probably humorless, universal reformer in the pattern of the nineteenth century. Born the child of a circuit-riding Methodist preacher, she supported herself as a seamstress at an early age. She was a friend of Susan B. Anthony and Matilda Joslyn Gage, and helped start the first Public Defender's office. Her first husband, Cables, was jailed for counterfeiting and she divorced him; her second, William Farrington (1853-1925), was a wealthy reformer, and the two in the late 1880s left Rochester, New York, for Aldrich, Alabama, where Farrington had started a successful coal-mining venture as a carpetbagger and built a model company town for its workers-all along the approved lines then being advocated in Germany by Bismark-and eventually ended up in the House of Representatives in Washington. In 1878, Mrs. Cables began the first branch of the Theosophical Society in the United States in Rochester (which attracted such notables to its ranks as George Chainey, Anna Kimball,and Hiram Erastus Butler), and in 1887 she started The Rochester Brotherhood, whose organ this journal also was. At the same time she was acting as the representative of the H.B. of L. for the Eastern United States. Cables broke with H.P. Blavatsky and the Theosophical Society-as did so many others-over Blavatsky's anti-Christian bias and the Mahtamas' failure to give practical occult help to members of the society. S.C. Gould entered the Theosophical Society (and probably the H.B. of L.) under the tutelage of Mrs. Cables "and was formally initiated as was the custom then, receiving the instructions and passwords, on December 11, 1885, and those words are fresh in memory today." "Theosophical Society, American Section," Notes and Queries 18/8, August 1900, 243-244. Cables was also instrumental in bringing to the Theosophical Society Anna Kimball and George Chainey, on whom see the Gnostic, into the Theosophical Society, as well as Hiram E. Butler of The Esoteric. George Crittenden, who assisted in editing and managing the journal, was an editor of the Rochester Post-Express.